Scientists at the Harvard School of Engineering and Applied Sciences have devised an ultra-thin, flat lens that focuses light without imparting the distortions of conventional lenses. Principal investigator Federico Capasso and his team have created the flat lens by plating a very thin wafer of silicon with a nanometre-thin layer of gold. Next, they striped away parts of the gold layer to leave behind an array of V-shaped structures, evenly spaced in rows across the surface. When Capasso’s group shines a laser onto the flat lens, these structures act as nano-antennas that capture the incoming light and hold onto it briefly before releasing it again. Those delays, which are precisely tuned across the surface of the lens, change the direction of the light in the same way that a thick glass lens would, with an important distinction. The flat lens eliminates geometric distortions, astigmatism and coma, and is completely scalable, which is why the physicists working on the project believe that in future, all the bulk components in the majority of optical systems can potentially be replaced by flat surfaces. Cambridge, Mass. 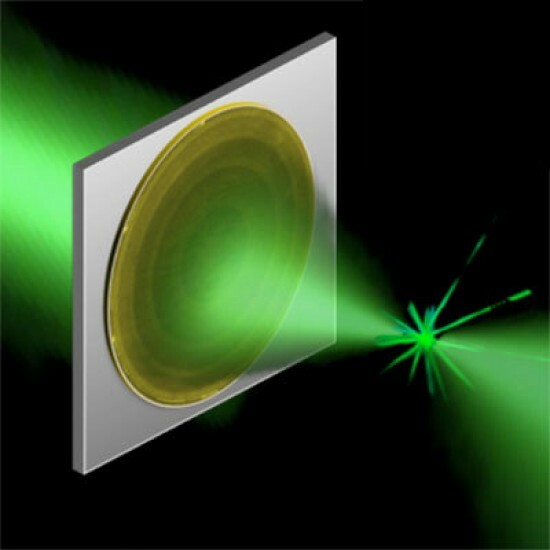 – August 23, 2012 – Applied physicists at the Harvard School of Engineering and Applied Sciences (SEAS) have created an ultrathin, flat lens that focuses light without imparting the distortions of conventional lenses. At a mere 60 nanometers thick, the flat lens is essentially two-dimensional, yet its focusing power approaches the ultimate physical limit set by the laws of diffraction. Operating at telecom wavelengths (i.e., the range commonly used in fiber-optic communications), the new device is completely scalable, from near-infrared to terahertz wavelengths, and simple to manufacture. The results have been published online in the journal Nano Letters. Capasso and his collaborators at SEAS create the flat lens by plating a very thin wafer of silicon with a nanometer-thin layer of gold. Next, they strip away parts of the gold layer to leave behind an array of V-shaped structures, evenly spaced in rows across the surface. When Capasso’s group shines a laser onto the flat lens, these structures act as nanoantennas that capture the incoming light and hold onto it briefly before releasing it again. Those delays, which are precisely tuned across the surface of the lens, change the direction of the light in the same way that a thick glass lens would, with an important distinction. The flat lens eliminates optical aberrations such as the “fish-eye” effect that results from conventional wide-angle lenses. Astigmatism and coma aberrations also do not occur with the flat lens, so the resulting image or signal is completely accurate and does not require any complex corrective techniques. The array of nanoantennas, dubbed a “metasurface,” can be tuned for specific wavelengths of light by simply changing the size, angle, and spacing of the antennas. Aieta’s and Capasso’s coauthors at SEAS included postdoctoral research associates Patrice Genevet and Nanfang Yu (Ph.D. ’09), graduate students Mikhail A. Kats and Romain Blanchard, and visiting scholar Zeno Gaburro. The work was supported by the National Science Foundation (NSF), the NSF-funded Harvard Nanoscale Science and Engineering Center, and the Center for Nanoscale Systems at Harvard (a member of the NSF-supported National Nanotechnology Infrastructure Network). The researchers also individually received support from the Robert A. Welch Foundation, the European Communities Seventh Framework Programme, and an NSF Graduate Research Fellowship.